Pain is often times confusing. Sometimes the pain is felt exactly in the area of tissue damage. An example is a tooth infection (abscess). The tooth and gum tissue are inflamed which cause pain. The patient complains of tooth pain. Other times, there is injury to tissue and pain is felt at areas different from where the tissue trauma has occurred. This is called referred pain: pain perceived at a site adjacent to or at a distance from the site of an injury’s origin. A clinical evaluation today illustrates this point. 45 y/o patient presented with 3 year history of left eye and headache pain which was nearly constant in duration, progressive in nature and 4/10 in severity with episodic flares. Patient had been involved in a slow speed rear end motor vehicle accident 3.5 year prior. She denied any prior history of headache or eye pain. Pain had significantly impacted her life such that she found it difficult to read. Treatment to date had included chiropractic care, physical therapy, narcotics, migraine medications, hypnosis, MRI’s and CAT scans of her head and consultation with Ears Nose and Throat doctor and neurologist. Physical examination was significant for profound tenderness in the cervical spine with difficulty in looking over her left shoulder due to pain. MRI of brain was normal. Unfortunately for this patient, nobody looked beyond her head for causes of her ongoing left eye and headache pain. Further evaluation at the Centeno –Schultz Clinic demonstrated that a small joint (facet joint) in her cervical spine was responsible for her progressive, debilitating pain. Diagnostic injections of local anesthetic in the left C2-4 cervical facet joint relieved her pain and enabled her to return to reading. Treatment options the Centeno- Schultz Clinic for cervical facet injuries include prolotherapy, ablation and stem cells. Unfortunately there is large emphasis placed on MRI’s in the diagnosis and treatment of pain. Radiographic studies are diagnostic tools which can assist in identifying a given patient’s pain when utilized in conjunction with a complete history and physical examination. When viewed alone, MRI’s do not tell the whole story. Englund et al, in the New England Journal of Medicine, reported that 60% of patients with knee meniscus tears on MRI had no pain symptoms. Matsumoto et al examined 497 patients WITHOUT pain and found the prevalence of degenerative disc disease to increase with age: varied from 15% in patients who were in there 20’s to 86% in patients older than 60 years of age. Jensen et al., conducted MRI’s of the lumbar spin in 98 patients WITHOUT back pain. 52% of the asymptomatic patients had a disc bulge. MRI’s of the lumbar spine in patients WITHOUT back pain were normal in only 36%. Diagnostic radiographic studies alone can not determine the source of a patient’s pain. At the Centeno-Schultz Clinic we are committed to finding the source of a given patients pain by completing a thorough physical examination, history and review of radiographic studies. Anything less is simply incomplete. 40 y/o female with 3 year history of left shoulder pain who had undergone left rotator cuff repair came to our office for evaluation. She had been involved in a rear-end motor vehicle accident 3 1/2 years prior. When the drunk driver struck her car, she was looking over her shoulder. Her pain was localized in her left lower neck and shoulder, constant in duration, 6/10 in severity and burning in character. Aggravating factors included lifting, extension and rotation . A sport’s medicine evaluation obtained a MRI of the left shoulder which was significant for a tear in the rotator cuff. Surgical repair was performed along with extensive rehabilitation. Unfortunately for this patient, her pain did not resolve. Referred pain is pain that is perceived at a site distant from the injury’s origin. A classic example is during a heart attack when a patient may feel pain in the arm, jaw os back rather than in the chest which is the site of injury. Facet joints are articular joints in the posterior aspect of the cervical, thoracic and lumbar spine. 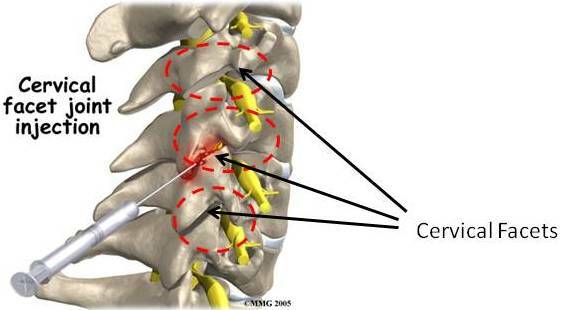 Injury to the C5/6 and C6/7 cervical facet typically results in pain in the lower neck and shoulder. Diagnostic injection completely resolved this patient’ s pain. Pain can arise from many different areas. A thorough evaluation is essential which is the standard of care at the Centeno-Schultz Clinic. Not all shoulder pain originates from the shoulder. The meniscus is tough fibrocartilage between the thigh bone(femur) and shin( tibia). There are two meniscus per knee: one on the inside (medial) and one on the outside(lateral). The meniscus functions as a shock absorber and therefore is critical. 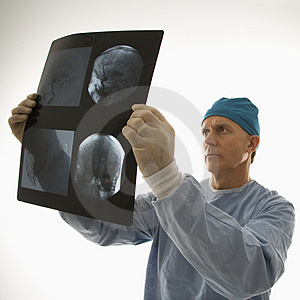 In viewing an MRI it is important to understand the view: frontal/side/ from the top or from the bottom. When viewing the knee from the side, the meniscus are two dark triangles between the femur and tibia(outlined in red). The meniscus is easily viewed from the front as demonstrated below. There are non-operative options to repair meniscus injuries which include the use of the stem cell therapy. The Regenexx procedure allow patients the opportunity to use their own mesenchymal stem cells to repair damaged knee tissue. Today the FDA recalled Synex II vertebral implants. The implants were recalled because they pose an imminent health hazard. Six adverse event reports have been filed to date which demonstrated moderate to severe loss of vertebral body replacement height. Other potential complications included neural injury, increased pain and need for reoperation/revision surgery. Synthes had a previous recall in Feb 2009. Vertebral implants are utilized in lumbar spine surgery and were thought to have a potential advantage over conventional fusion techniques. Surgery is a one way door: once undertaken one can only move forward. Complications are part of the risks of surgery. 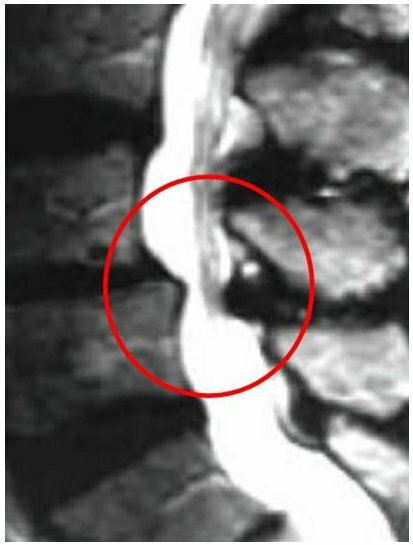 Removal of the disc, which functions as a shock absorber, can result in pressure overload in adjacent levels thereby advancing the degenerative casade. A non-surgical option for the treatment of lumbar disc disease is the use of your own stem cells. Utilizing the Regenexx procedure, patients have had reduction in their back and leg pain. The knee meniscus is tough fibrocartilage that is positioned between the thigh(femur) and shin bone(tibia). Each knee has a two meniscus: lateral and medial. They are C shaped. They function as a shock absorber protecting the delicate cartilage in your knee. Injury can result in a meniscal tear. There are several different types: horizontal, radial, oblique and longitudinal. Surgery is often recommended despite the fact that 60% of meniscal tears are not associated with pain. Menisectomy is where a portion of the “damaged” meniscus is surgically removed. While the “damaged” area is removed often patients fail to obtain significant pain relief. Furthermore studies have demonstrated that menisectomies increase the rate of cartilage loss in the joint. This make sense since by removing a portion of the shock absorber, the forces of daily living are transmitted to the delicate cartilage. The cartilage was not intended to bear this increased stress and therefore starts to degenerate. The use of your own stem cells is now an option for patients with meniscus tears and degenerative changes in the knee-joint. A patient returned today after 6 weeks of specialized physical therapy(Egoscue). She is a changed woman with significant reduction in pain and increase in motion. She asked that I share her story. History: 4 year history of neck and right shoulder pain after a motor vehicle accident in which she was struck on the driver’s side door by a motorist who elected to disregard a red light. She had no prior history of neck or shoulder pain. Pain was constant in duration, progressive in nature, 6/10 in severity, involves both right and left side of neck with radiations into the right shoulder and scapula. Aggravating factors involved lifting and turning her neck. Treatment to date had included physical therapy, steroid injections, large doses of narcotics and muscle relaxants, Botox injections and surgical evaluation who recommended an urgent two level fusion at C5/6 and C6/7. Physical examination was striking. Patient was wearing a soft cervical collar which she had worn for the last 2 years. Upon removal, the patient was unable to keep her head up. Her head, like a rag doll, simply falling forward. She had to place her finger underneath her chin to support the weight of her head. Rotation, flexion and extension were all severely limited. Muscles form our foundation. The provide critical support. This patient had an injury to her longus colli muscle. The longus coli is located anteriorly and enables flexion and rotation of the spine. It works in a complimentary fashion with the posterior neck muscles to stabilize the cervical spine. Similar to the ropes that support a tent pole , if one of the ropes is cut the tent pole ( cervical spine) is no longer supported and typically falls to one side.